Niantic has introduced three new Legendaries into Pokemon Go. Here's when and where to find them. For all of the game's keen raid battle enthusiasts, Pokemon Go developer Niantic has some all-new Legendaries on the horizon. The company has recently taken to their official website to announce the imminent arrival of Raikou, Entei, and Suicine into the game's popular raid battle feature. Unlike past Legendary raid bosses, however, these creatures will be sticking around not just for a week but for a whole month, and not every Legendary will be available in the same place at the same time. 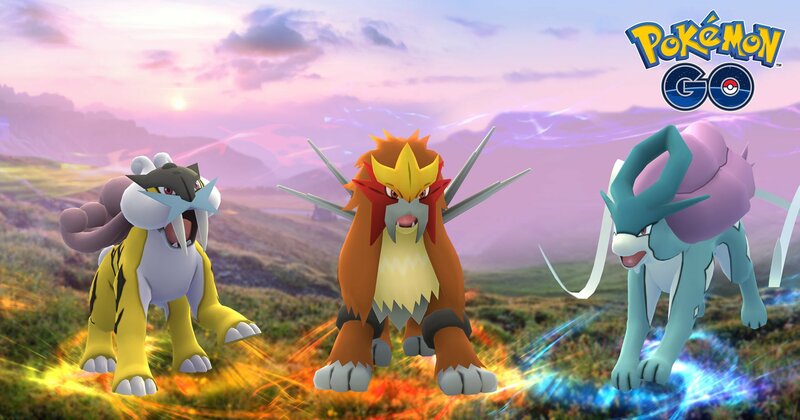 Read on to learn where to find Raikou, Entei, and Suicine in Pokemon Go raid battles as well as the available time frame for when players will be able to battle and capture these Legendary creatures. The latest Legendary Pokemon to land in Pokemon Go won't be disappearing after a week like the game's previous raid bosses. Instead, each Legendary Pokemon will be available in a set region within a specific time, with the creatures rotating their posts every month. For example, Raikou will appear throughout the American continent for one month; after that, he'll cycle out to other regions, while another Legendary creature takes his place. • Raikou, the electric-type Legendary, will appear in raid battles across the Americas. • Entei, the fire-type Legendary, will show up in raid battles across Europe and Africa. • Suicine, the water-type Legendary, will begin its stint throughout Asia and the Pacific region. These conditions will stay true from today, August 31, all the way through Saturday, September 30. After that, all of the Legendaries will swap places and stay in their new location for a month, after which the process will repeat itself once again on October 31. The specific rotation in which these Legendary Pokemon will swap out is currently unknown, but with that said, the American continent has a chance to either see Entei or Suicine after September 30, and whichever creature it hasn't seen by then will be the one to arrive after October 31. Feel your brain swell with Pokemon Go know-how by reading some of the crucial and informative guides we've featured over on our Pokemon Go tips and tricks guide hub.